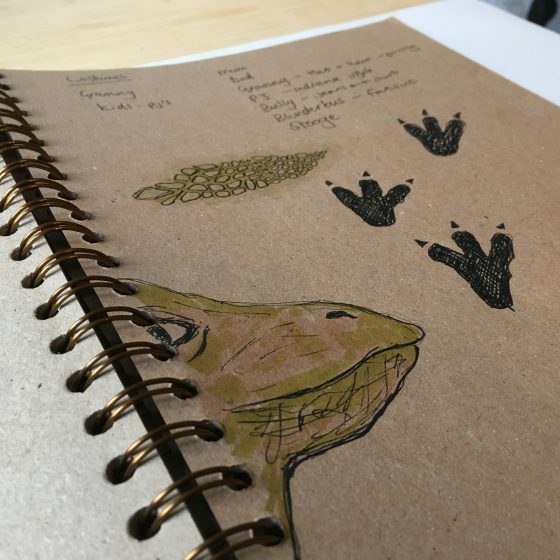 The Babbling Vagabonds design process starts with the story we want to tell and a big sketchbook. We talk about the story and the scenes within it, the characters and the locations. Ideas are important at this stage and we try not to limit our creativity. It’s very much a collaborative process between the three of us. We are not afraid of being wrong when we voice ideas and to be honest I think the three of us have a very special relationship. We don’t censor our creativity, anything is up for discussion. Pinterest is a good source of inspiration for us and we have a shared board for the story. We look at characters types, environments, costume and Pin anything we think is relevant to our story. A storyboard of the essential action is drafted. We find creative ways in which to make the locations and where scenes can take place. There is usually only four actors in our Christmas show and whatever is designed has to take that into account. This will be our 6th production at The Guildhall Theatre in Derby, we know space well and how to get the best from it. 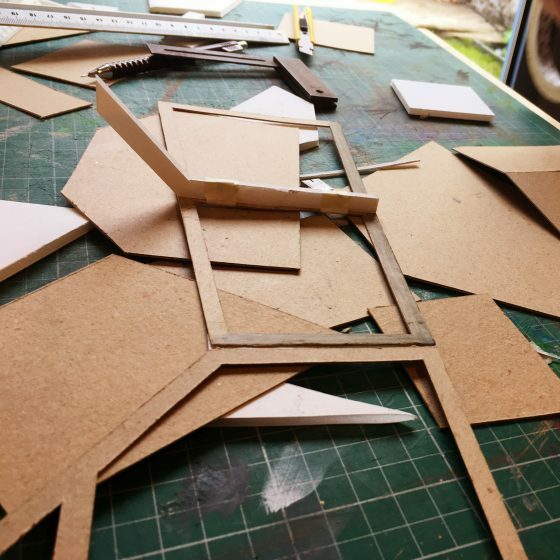 We don’t have to worry about touring the production and making the set fit in different venues, this means we can design a set that is bespoke to the venue. We have a scale model of the theatre and its within this miniature space that we start to realise the ideas from our sketchbooks. Making the model is all about playing. It is about seeing design ideas in a three-dimensional form and within this part of the process that you can see if an idea is going to work. We never see things as a problem, always as a challenge, and through design we find solutions. 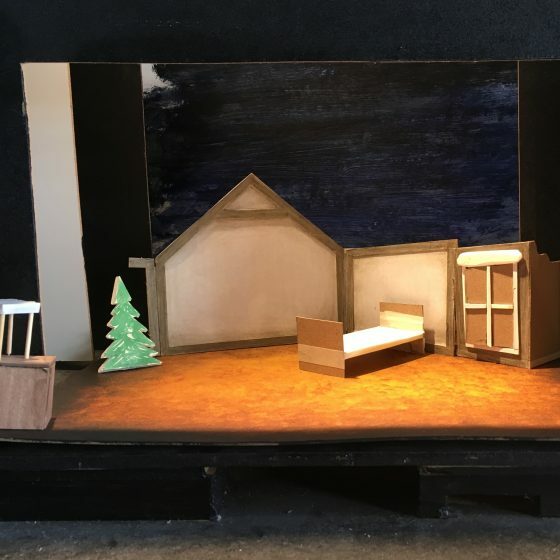 The model helps to see the theatre space as a whole and its often at this stage where you start to understand how certain scenes within the story will play out. The model box changes all the time as we search for the ultimate design. Pieces are thrown away to make way for more exciting ideas and solutions. 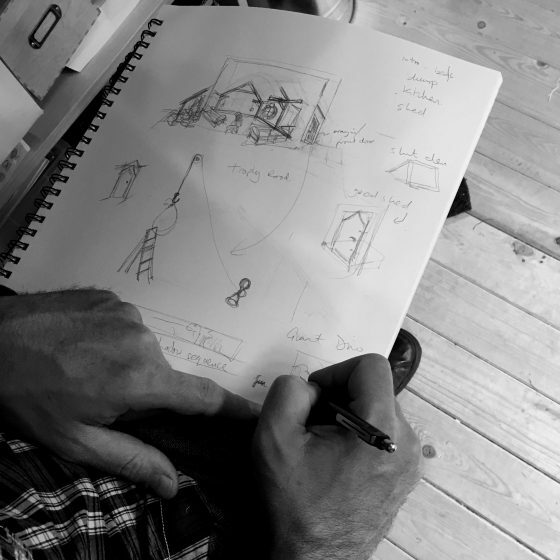 It is a vital part of the design process and an amazing way of sharing our vision. Colour becomes an integral element of the modelling stage and brings together all the elements of the design. The colour palette really helps when we venture into the next stage of building the set. Working as we do means we are flexible and have the ability to adapt throughout the whole process as things may change…again, and again and again.